The top government Japanese official recalled Fidel´s visit to his country and its significance for the strengthening of bilateral relations of friendship between the Japanese and the Cuban people. 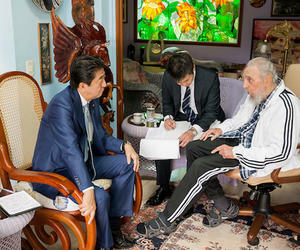 Both Fidel and Shinzo Abe addressed the long-standing links between the two nations. They also exchanged views on the world´s current challenges and dangers and on the need to strengthen efforts aimed at eliminating nuclear weapons and preserving world peace.